From sea to shining sea, these states are the best places to buy a house in 2015. Thinking about buying a house? Maybe moving to a new state for a fresh start? In either case, you'll want to consider all the important factors that shape the housing market wherever you and your family decide to buy. We've done that here, and we've also included our picks for the four best states to own a house. To determine why one state is a better place to own a house than another, we need some basic criteria to guide our decision making. Our objective is to consider the real estate market, the broader economy, and the quality of life a state offers. First, a lot of the differences will have to do with economics. States with more job availability, high salary opportunities, and an overall more stable job market tend to be better markets for owning a house. A robust labor market ensures there is a consistent supply of homebuyers to support home prices, as well as a way for you to make a decent living. Population demographics matter as well. The more people moving to a region, the higher the demand for owning a house. That will support home prices. Population inflows are also a great indicator of the general economic and cultural health of a region. And don't forget quality of life. It means activities that will make you and your family happy and healthy, whether it is the outdoors, the arts, educational opportunities, or access to healthcare. That may mean mild winters and four seasons, snow and ski slopes, or beaches and boats. This factor is qualitative, not quantitative. Without further ado, here are the four best states in which to own a home. 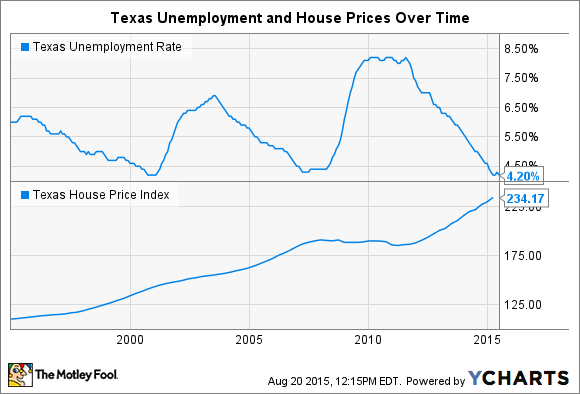 Texas Unemployment Rate data by YCharts. Further, Austin, Texas, was ranked as the top local economy to raise a family in a study that considered the town's growth, economic stability, and housing market. 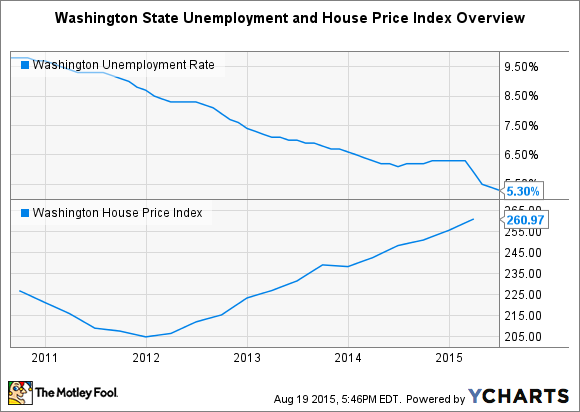 Despite its generally rainy weather, Washington is a fantastic state to own a house. The average wage in the state is $52,540, a number that puts Washington among the top of all states in the U.S. That salary is worth a bit more in Washington, as well, because the state does not have a state income tax. The Seattle area is a hub for corporate headquarters -- the list includes Microsoft, Amazon.com, Starbucks, and Costco, among others -- and the city is also consistently ranked as one of the top cities for getting outdoors and into nature. Washington's real estate market was not as resilient during the recession as Texas's was, but it has since recovered nicely. The general consensus is positive on the state's economy and real estate market. Washington Unemployment Rate data by YCharts. With mountains in the west and beaches and coastal estuaries in the east, North Carolina's geography is as diversified as its economy. Charlotte is a major center in the financial industry, and the Research Triangle Park between Raleigh, Durham, and Chapel Hill is home to hundreds of technology, life science, and healthcare companies. North Carolina is also home to a high concentration of leading universities, as well as some of the top medical research hospitals in the country. These areas have seen a population boom in recent years, driven by the diverse job and higher education opportunities. The state has gained recognition for its quality of living of late. Money.com recently ranked Apex, North Carolina, as the No. 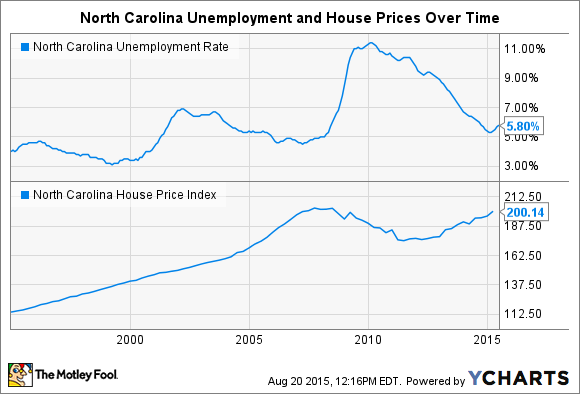 1 place to live in all the U.S.
North Carolina Unemployment Rate data by YCharts. 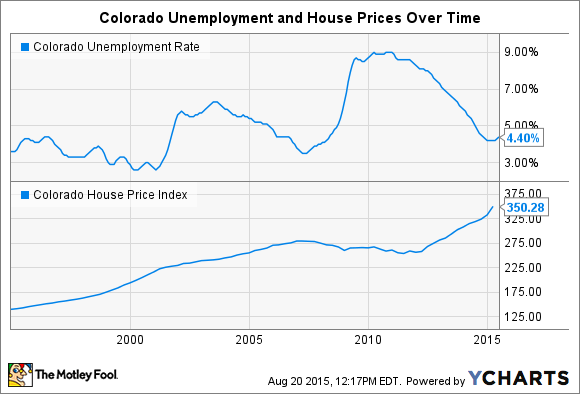 Lastly, Colorado is an excellent state to own a house. The state has relatively high wages compared to other states and a dramatically improving labor market. The state's unemployment rate dropped to 4.2% from 6% in the last year alone. The state's housing market is also quite strong, characterized by Bloomberg's assertion that the Boulder market was the top housing market in the country for 2015. Colorado's economy has been routinely ranked in the top five in terms of both growth rate and overall health. The state's GDP grew 114% faster than the overall U.S. economy last year. Colorado Unemployment Rate data by YCharts. The reality of ranking the top states to own a house is that the right answer will be different from person to person and family to family. To me, these four states fit the bill with the right combination of economic strength, a healthy real estate market, and a suitable quality of life. The key is to consider what you and your family need to be stable, healthy, and happy. Only after that should you consider the economic considerations of a house's value over time.